Quick-Peg™ Custom Firing Peg is a paste that is squeezed into/onto the restoration, and placed onto the peg/firing tray. It dries quickly, holds the restoration in place during firing and is removed easily. It can be used with all-ceramic or porcelain-fused-to-metal-restorations. It can also be used for degassing and staining and glazing. It is especially helpful in eliminating the frustrating balancing act experienced placing the crown onto the peg. 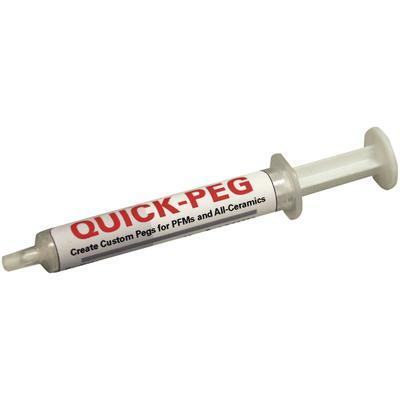 With over 60 applications per 10 cc syringe, Quick-Peg is economical enough to use with every type of restoration.